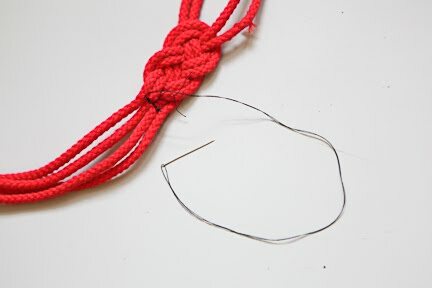 The following pictures show you step by step how to make the sailor's knot with your first two strands of rope. Pay careful attention to which strand is on top or under the other. For more help click here. 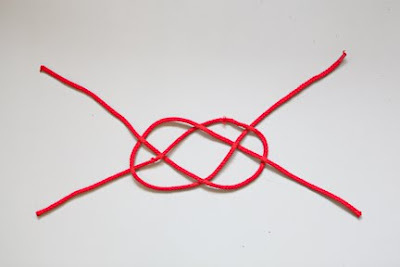 Now take your third and fourth strands of rope and snake them side by side into the knot by the first two strands. 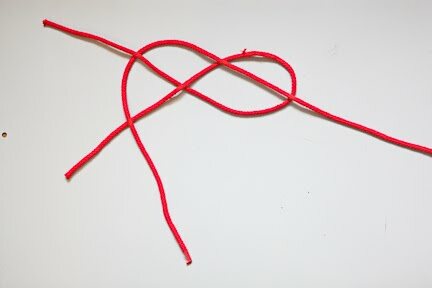 Slowly pull the knot tighter, keeping it even and the knot flat. 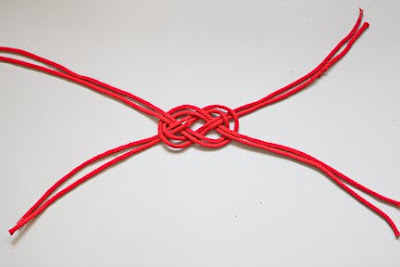 Here is a closeup of how the knot should look now. Take your needle and thread and about 1 inch from the knot sew together the four strands of rope to keep them flat on the back.. Trim your ropes so that all of the ends are even and the whole thing is about 19 inches long with the knot at about 7 1/2 inches (so that it is on the side of your head). Cut two pieces of twill at about 3 inches. 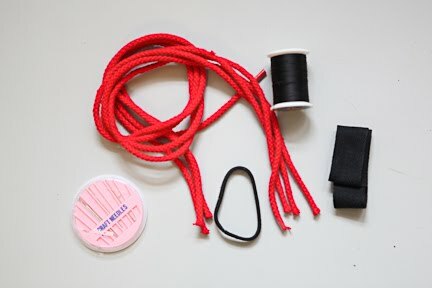 Using your sewing machine or your needle and thread sew both of your ends flat. 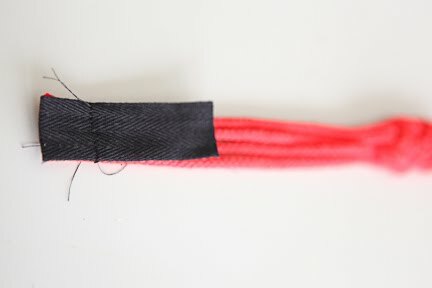 On the shorter side of the headband (closer to the knot) and on the front of the headband, line the edge of the twill with the end of the rope and sew with your sewing machine at 1 inch from the edge. Fold the twill down over the stitch line and flip the headband over so you are seeing the back. Place the hair holder inside of the twill tape as shown. Fold at about 1/4 inch. Now fold up so that the folded twill tape covers the stitch line. 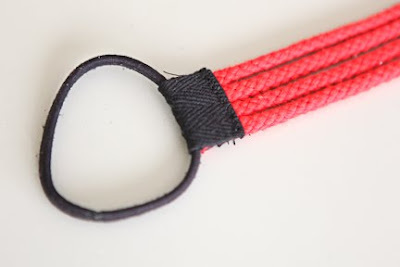 Sew this edge down as well. Try on the headband to see if you need to take any length off. 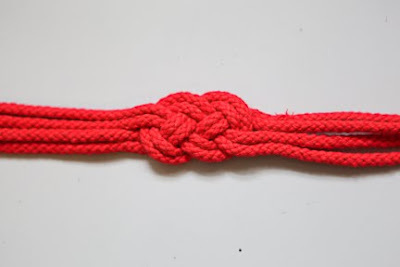 If you do then trim off a little rope before continuing. Now repeat the previous steps on the other end of your headband (the longer side). In the end it should look like this. Isn't it great? 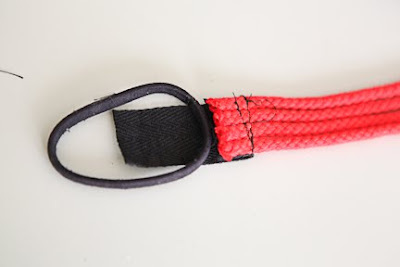 I want to try something similar for a belt as well. I will show you when I do. Enjoy making your own now. This is such a cute idea! You make it look so easy. Thanks for showing how to make it. I will definitely make one of these. Thanks for the great tutorial! i love this!!! really, this is very awesome. Thanks for sharing--I love it, too! It's very nice. Thanks for the tutorial. 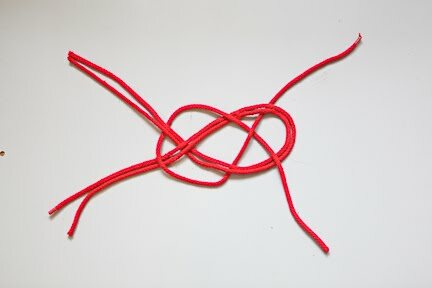 That came out really cute and you explained that knot so well! Thanks so much, I'll be linking. Absolutely love this. Found you via one pretty thing. So glad I did! It's great idea! Thank you for sharing. 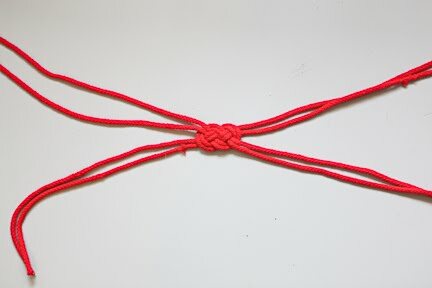 I made a bracelet too, it looks really nice! Great project! I just wanted to let you know that we featured this project on our Facebook page with over 13,000 fans. We’d love it if you’d use our Featured Blogger button, available at: http://www.dailycraft.com/thank-you-for-crafting/. Our audience loved the project and we look forward to sharing more from you. Please let us know if you have any questions or projects you’d love us to feature! Thanks! Hi,I really love this look.Nice summer beachy look. 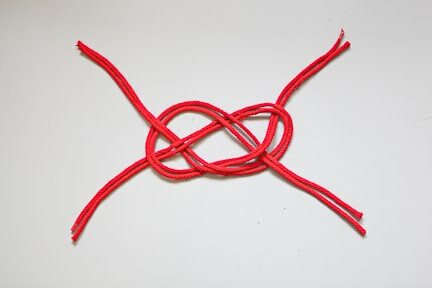 I love knots!!! this one I will have to make! Thank you for sharing! Thank you for sharing this! 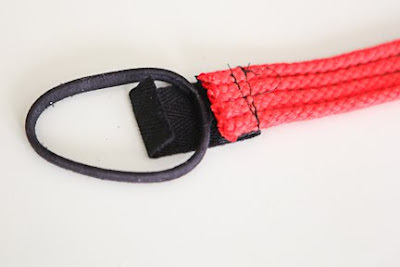 I was wondering would you be able to tell me where I can get this kind of rope? Just linked to you http://tempestahoy.blogspot.com/2011/09/nautically-embellished-polos-mini.html - LOVE this! love it. Great tutorial, thanks for sharing. Thanks so much! My bridesmaids will be wearing these!! awesome! 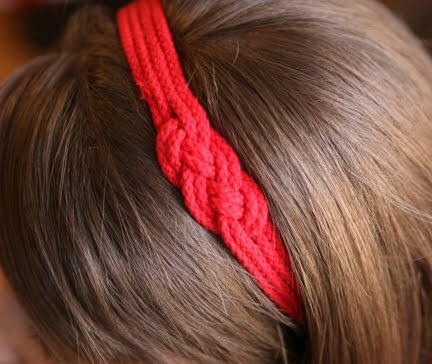 have been looking for instructions on how to make these headbands but with pictures insteadof just written directions!! thank you for showing me this pinterest. Isn't this Cami's (youseriouslymadethat.blogspot.com) idea? did you copy it? you know its funny, but i came across her post about a year after i made my post (although i think cami's was actually posted first). all i can say is that good minds think alike:) in fact i have seen other similar tutorials before either of ours came out. 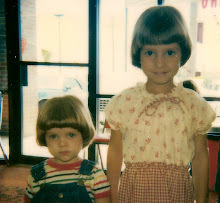 i think it's inevitable in the world of blogging that there are repeats - especially when there are fads such as nautical. this isn't the first time this has happened. in fact if we want to talk about copying we both copied something that we saw in a store - mine was from urban outfitters. oh well. it just happens. i think it's good though that you are looking out for your friend. Hi love love love this and will probably have my bridesmaids wear for my nautical themed weedding. Can you tell me where to look for the rope? I've looked everywhere and can't find it! I found mine at JoAnns in the trim by the yard. I would look online as well if you are having a hard time finding it. Good luck! and Congratulations! Just made this today for my daughter to go with her DIY tank maxi dress I made.....turned out SO cute! Thanks for such clear and easy directions! 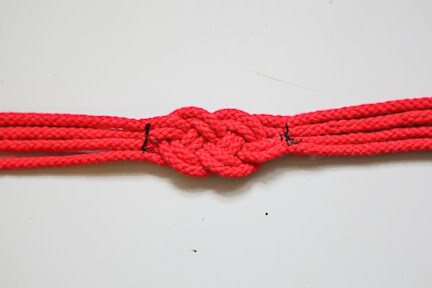 I would like to create a nautical bracelet that my boyfriend loves for his birthday. Do you think you could reproduce it ? Thanks for the tutorial. Really loves the outcome. This was so easy to make. 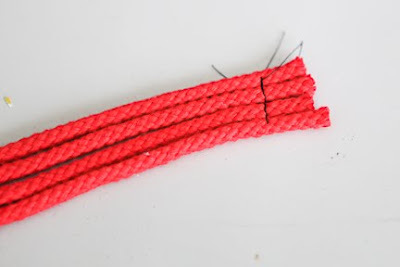 I used boot style shoe laces I had around the house. It was done in no time at all. Do you really need 4 yards of rope to make one? This is truly a great project for just about anyone! 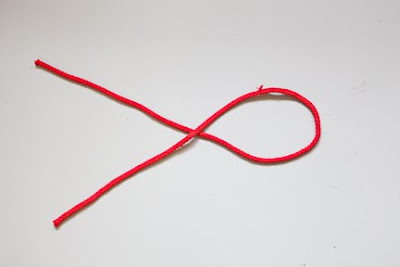 Although I suggestnot making the yarn quite so long, because you dont really need it. I started out with only 2 feet and still had to trim quite a bit off! But it was a great experience learning tomake somthing new!! Hi, where did you get the rope ? I think it's a great idea. Beautiful. 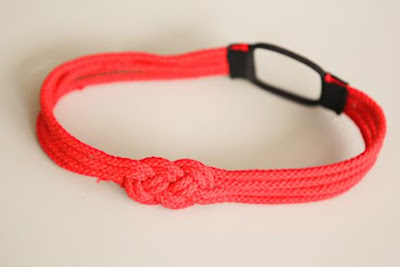 Love the red rope. WHere can I find red rope? I love it! Thank you for the tutorial. VERY NICE WORK, ALSO, IT IS VERY EASY TO MAKE. I WILL! 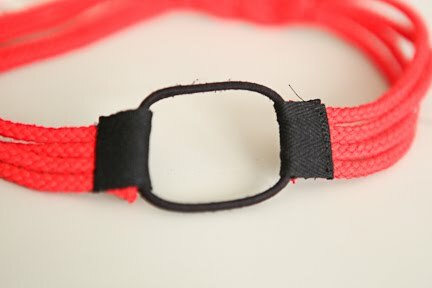 Nice Post...thanks for sharing this information....If anyone looking for best headbands online. visit kooshoo.com..
Looks like one of those vintage headbands. Very pretty and simple. 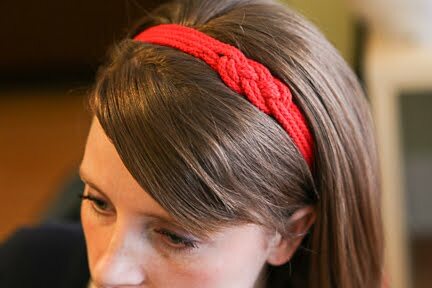 These headbands look nice and trendy. Thank you! I just made these for my 3 little girls to wear tomorrow. They turned out way cute and didn’t even take an hour to make 3 of them. Thanks again! 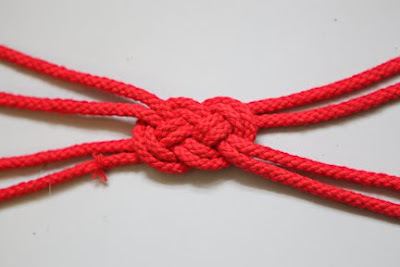 Thanks for such a great tutorial...this is so cute and I will definitely make this. 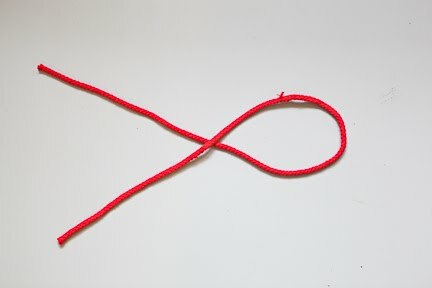 One question: the length of the rope. 1 yard seemed too long to me, do you use 1 yard on purpose? Should I measure my head and then cut the rope? Super cute idea. Gonna give it a try. 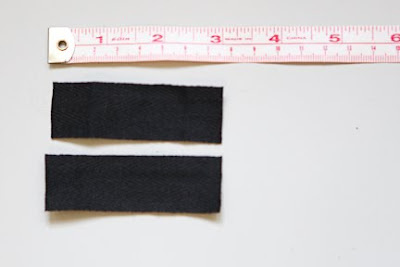 Thanks for posting this headband DIY instruction. 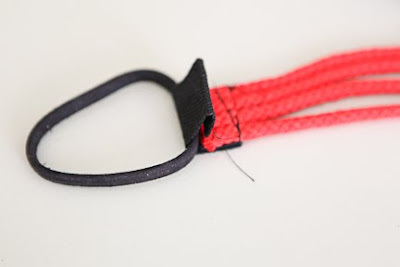 The design of DIY headband is so gorgeous!Thank you for sharing this impressive tutorial!DIY accessories making tutorial. Thanks. I made this and it turned out fab. Thank you for sharing. It's really a beautiful diy project.